You all know I got four children but the ones of you that know me in real life, also know that I have some extra 10,000 to 50,000 little girls. The number depends on the time of the year! 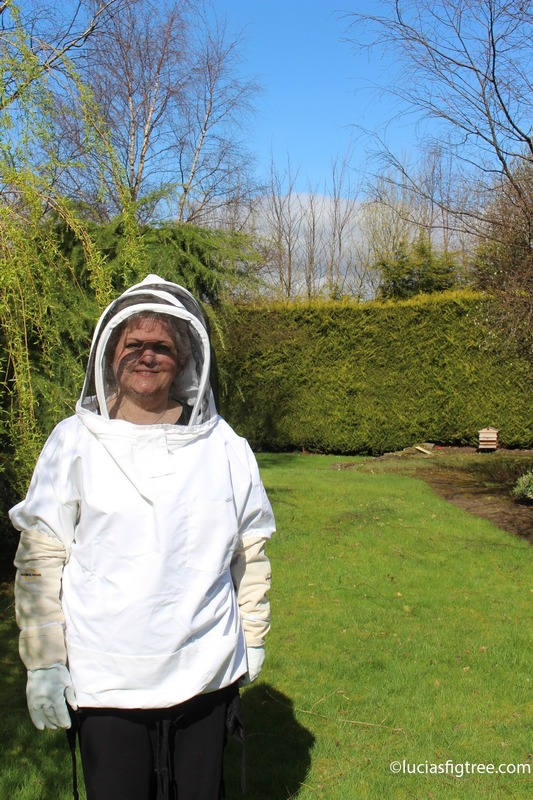 I am an urban beekeeper! Even simply sitting down near the hive with a cup of tea or..indeed a crochet project and watching the coming and going of the hive is an extremely relaxing experience. 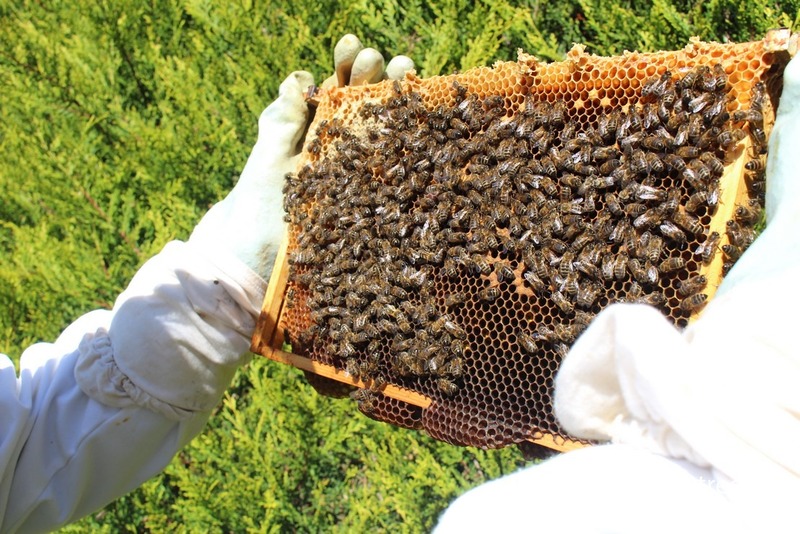 I went into beekeeping for many reasons, one of them is that by keeping just one hive you are immediately introducing 50,000 pollinators into an urban area, and that can have a huge impact on the environment. I like the idea of making a difference as an ordinary individual, considering the fact that , most of the time, we can’t seem to affect any of the sad things that are happening to the earth. 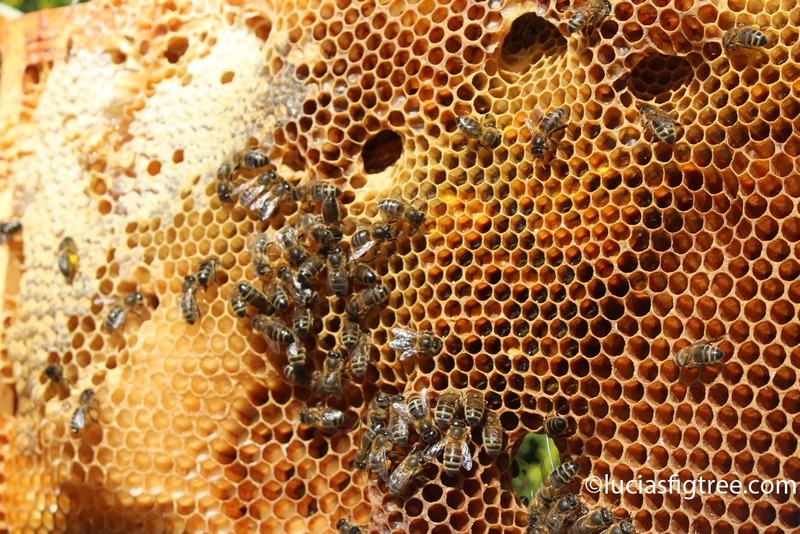 As many of you ,due to the media coverage, I started to become aware that bees were having a hard time from a combination of pesticide use, parasites and poor nutrition, and it also became quite obvious that they were doing better in towns and cities than in the countryside. I guess reduced pesticide use in towns, coupled with year-round forage in gardens and parks means honeybees could have a better chance of survival in urban areas. So that is why they love their home in the middle of Glasgow!! 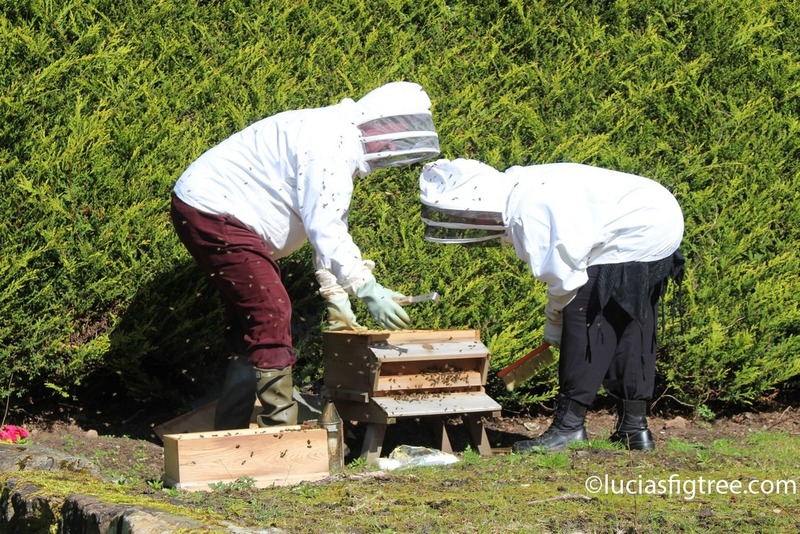 I couldn’t have managed any of the above without the help and expertise of Ed, ( you can see the two of us checking the hive’s progress and doing some spring cleaning… ). Ed used to be at school with one of my brothers in law and is a professional beekeeper and an expert in urban beekeeping . He owns several hives of and also he helps people like me that want to keep bees as a hobby. 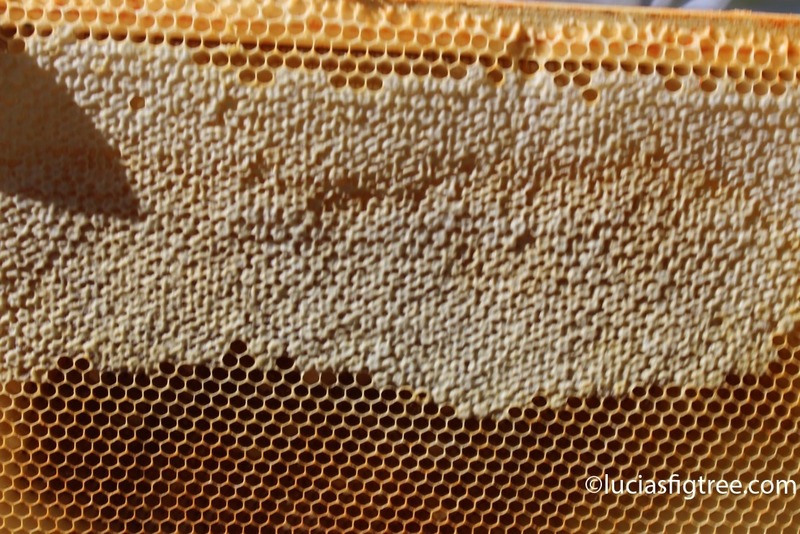 in the picture below a frame of raw honey, plenty of food for all the new bees ready to hatch. 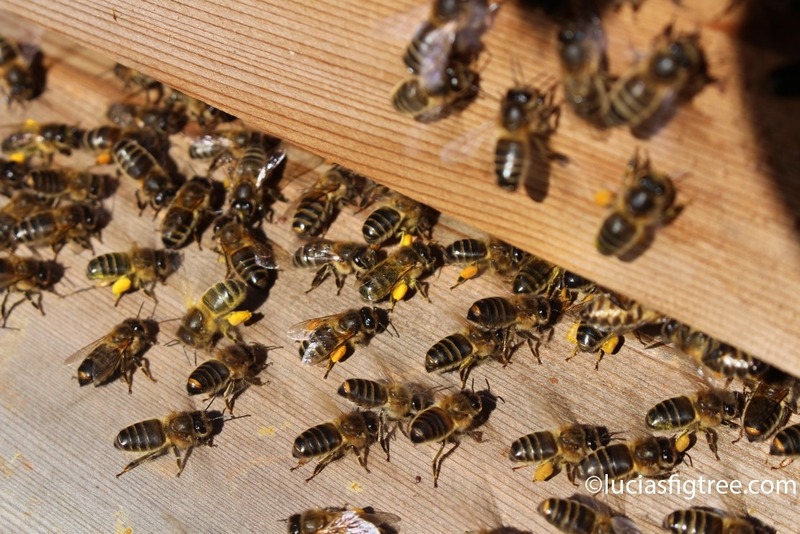 Look at the girls coming in carring little bags of pollen on their legs! I am soo hooked on beekeeping that in the next few weeks I think I will split my original colony and add another hive as I got plenty of space and they seems to love their spot. I could go on for pages telling you loads of stories, fact and technicalities but this blog is about crochet, so, back to yarn, colours and hooks, my next project is dedicated to my lovely buzzing girls! Like us, bees are trichromatic. That means they have three photoreceptors within the eye and base their colour combinations on those three colours. Humans base their colour combinations on red, blue and green, while bees base their colours on ultraviolet light, blue and green. This is the reason why bees can’t see the colour red. They don’t have a photoreceptor for it. They can, however, see reddish wavelengths, such as yellow and orange. They can also see blue-green, blue, violet, and “bee’s purple.” Bee’s purple is a combination of yellow and ultraviolet light. That’s why humans can’t see it. The most likely colours to attract bees, according to scientists, are purple, violet and blue. So that is what I have chosen as hues for my next blanket!…I am soo excited about as it is going to be beautiful !! I let you see a small preview..because I have already started …. to the next, stay tuned!!! I can only imagine the relaxation you describe while sitting with your bees. The blanket thus far looks like it’s inspired by the shape of a honeycomb. I’m following the progress. Thank you for such wonderful work. Hi Lucia! Really interesting post. I used to want to keep bees, but as I saw bees swarming once, I got too scared to try. Like so many, I’ve been aware of the loss of bees, and I’ve signed petitions against the use of pesticides that harm them…but it never occurred to me that I could help by actually keeping some! Food for thought. The new blanket looks fabulous, can’t wait to see it develop! Che meraviglia LUCIA… Il mondo delle api mi ha sempre affascinato e leggere di loro sulle tue pagine mi ha proprio sorpreso e incuriosito! Un grosso in bocca al lupo per il tuo prossimo progetto ispirato dalle tue bambine alate… E quando puoi raccontaci un po di loro…. This looks wonderful, thank you for sharing. I love the idea behind the colours. We are beekeepers too but in a rural area ( Lincolnshire). Your April ( apiary?) blanket might be the push I need to make one for me, I am fascinated by the colours of the pollen the bees bring in so I might use that as a basis for mine. I am really enjoying your year of blankets and I am totally in awe of your creativity and dedication. Fantastic Jenny! I m working on mine at the moment, and I have no idea what the blanket is going to look like! that one of the things I like most of wht I do it is to see the blanket developing, and making something that has a meaning. I would love to see your blanket when you are done! and also we can have a lot of bees’ chats too !!! It has been lovely reading about your love of bees – I feel like I know you now. 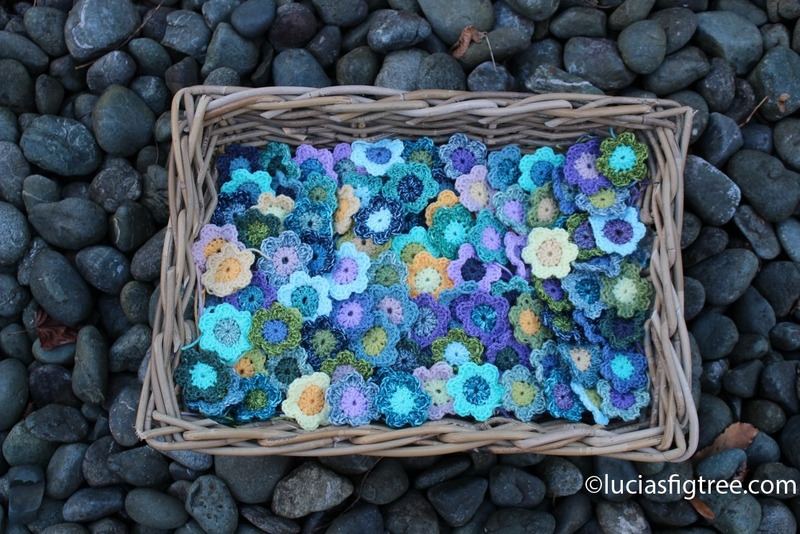 I also love what you are doing with crochet and thank you for sharing with us. My name is Lucia, I am originally from a small village in northern Italy, but I have been living in Scotland for the last 25 years, I am a mother of four lovely kids, well not really kids anymore..my oldest is 23 and my youngest 12. I did architecture at University in Venice and my love for fabrics, interiors and colours and yarn as been not only part of my job but also my hobby too. I started to crochet when I was young during my summer holiday in Tuscany with my two grandmothers, their cousin Mariuccia and several other ladies which regularly came for few hours every day, under the shadow a massive fig tree. It was an oasis for chatting, learning crochet, knitting plus cooking naturally! Time has moved on, and I live in another country, so I decided to take advantage of the Internet and create a virtual fig tree where we can all gather together and make things! Is it TOO EARLY ??? ?